I’ve always been fascinated by design for as long as I can remember. Before I even knew what user experience design was, I cared about ease of use, and was hyperaware of experiences that didn’t seem to be intuitive. Whether it is the way a car dashboard groups buttons that performed similar functions, or how video streaming services utilize the space bar as a key pause/play function, I have always been cognizant of how design affects our ability to interact with our world in an easier, and more efficient manner. In fact, the design of objects and systems are at the core of nearly everything we use on a daily basis. So, when an innovative approach comes along, I eagerly dive in, trying to figure out whether it will help our clients design better experiences for their users. Take for example, the idea of taskonomy. Aside from appearing to be a take on the term taxonomy, taskonomy is based on the Jobs-To-Be-Done (JTBD) mentality, a framework founded by Anthony Ulwick. Taskonomy was first coined by anthropologists Janet Dougherty and Charles Keller to reflect a way to organize human activity based on behavior rather than dictionary classifications. In the world of building websites, it means that a website menu should be grouped and ordered by what people visit the site to do rather than a hierarchical listing of the organization’s departments. 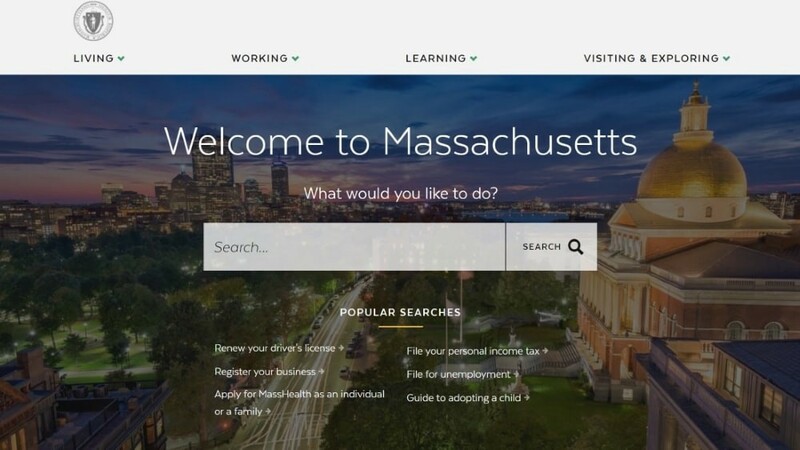 When we first started the Mass.gov redesign project, we were excited about the opportunity to partner with them to help make their site more constituent-centric. For us, that meant helping site visitors find what they need to do easily and quickly, thus also saving state government employees time and energy to better focus on governing effectively. We started with the question: Why do people visit Mass.gov? In the world of websites, there are those you want to visit and those you have to visit, and those that are a combination of both. Oftentimes, a government website is one you have to visit to complete a task, or obtain certain information (unlike Facebook, which for many people has become a website you need to be dragged off so you can eat dinner). If you think of the average person who visits a site like Mass.gov, they probably need information on how to do something (e.g. how to file for unemployment) or the resources to actually complete the task (e.g. forms to file for unemployment). This is what led us to using the approach of taskonomy. Identifying broad-sweeping audiences, such as taxpayer, parent, student, etc. We started by identifying audiences, example users, content needs, and types of actions they were likely to take. We used a sliding scale to assess these audience members’ conceptual model, language preferences, motivation for visiting, and their type of engagement. Is their conceptual model more task-based or department-based? Do they prefer direct or legalese language? Are they coming to the site voluntarily, or because it’s mandatory? Do they need to obtain information or complete a transaction? When we performed a landscape analysis of other state websites, we noticed a pattern: many were based on getting their constituents to their desired information quickly and efficiently. As we looked at the sites of the other 49 states, we noticed that there were some distinct differences by state in terms of what services they provided for their constituents. For example, some states are involved in end-of-life treatment, whereas Massachusetts doesn’t address that at the state level. In terms of browsing and searching behaviors, we found that it’s nearly a 50/50 split in terms of which method people prefer in terms of finding content; some people opt for search whereas others prefer to traverse the hierarchical structure to find what they’re looking for. Through a comprehensive, partnered effort with MassIT stakeholders, we identified a list of 720 tasks for which constituents would visit the Mass.gov site. The need for the first approach is obvious given that the entire purpose of Mass.gov is to serve all of its constituents and often, government sites default to listing all of the different agencies that make up their organization using acronyms and jargon that only insiders know. This is natural as we see the world through our perspective rather than that of others. However, enticing people to visit and take action on a site is largely based on the ability to design the site based on user needs and behavior. Governments, nonprofits, associations, and other large organizations are quickly realizing that they need to be user-focused. Similarly, this belief holds true for self-knowledge as well, causing us to believe that we know about our own habits, until we actually track data about what we are eating, spending, or doing with our time, only to be jarred by the rude awakening that we don’t know ourselves as well as we had assumed. Data tells a different story than assumptions because they are based on facts, as opposed to conjectures. All of the identified tasks rolled up into the primary navigation of the site; Living, Working, Learning, and Visiting & Exploring. This approach helped break the mold from what government agencies are to what constituents need. We also created a Your Government section for the hierarchical listing of all the different agencies (this is not live on the pilot site yet). 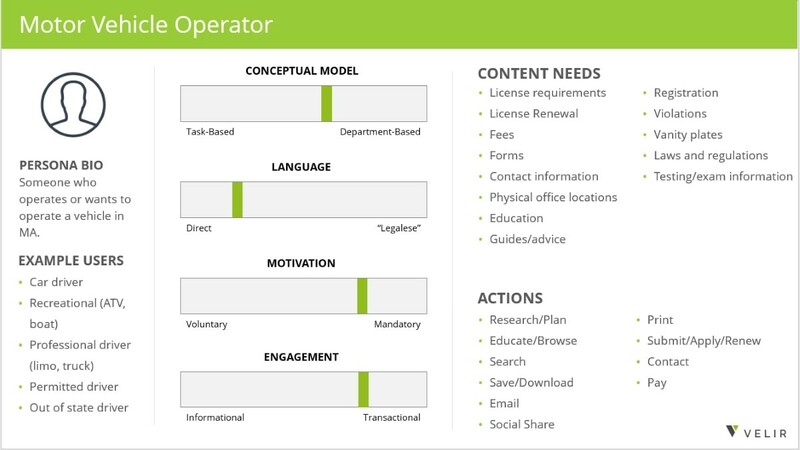 As we started working with this taxonomy, we realized that some subcategories have a lot of different actions; for example, we found so many actions under business resources that we wondered whether they would be better served by being split up. For the minimal viable product, we devised three layers to the site, starting with the site section landing pages listed above, and then topic and subtopic pages. We used a verb format to be constituent-focused. The first level was easy to map to (Learning, Living, etc.). Then we realized that certain tasks overlapped. Say you live in Massachusetts and your child needs to go to school here. We developed a system so that things aren’t so structured that they couldn’t be cross-promoted. This means that parents who live in Massachusetts will also be shown information about sending their children to school. This informed the need for actions themselves to be free-floating so that they aren’t hierarchically restricted to just one group. When we first started working on the Mass.gov project, we found that Mass.gov has a portal — an overlying structure that attempts to group content by topic instead of organization. Once a user clicks into a specific topic area, links point to organization sites, which have their own navigation structures, and at times their own logo and color scheme. This makes each page look similar enough to feel like it’s a part of the same site, but in reality, these organizations have the freedom to group their content however they choose, making for an inconsistent user experience. This confirmed that MassIT knew that they needed a cohesive structure but hadn’t fully revamped the underlying layer to truly provide that consistency. Another big goal is to ensure business processes run smoothly for the state, so that it has more time to deal with what matters. For users, this manifests in the form of access to things such as Quick Actions, which are listed at the top of the page and allows them to do what they need to do right away through links to other action pages or transactional sites. We also provided structured contact pages so that users could find things like contact phone numbers and Google maps of physical locations they would need to visit such as the RMV, etc. Our mandate has been to create the minimal viable product based on a quasi-agile methodology. 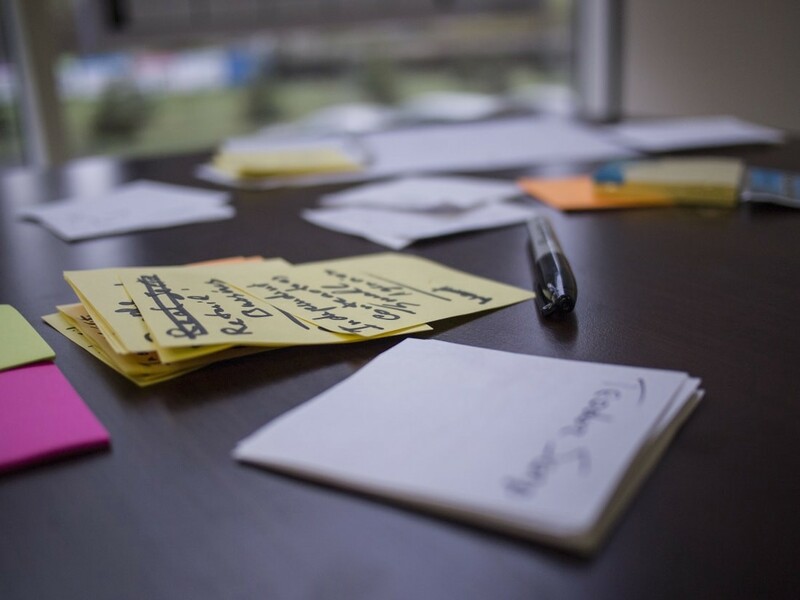 Through user testing and iteration, we soon realized that our three-level structure was too rigid, especially given that certain topics can be quite extensive. We also realized that the opposite was also true; certain tasks like voting are more straightforward, and a user didn’t need to go through three topic pages, explaining the task and process. Given this challenge, we decided to allow topics to be nested infinitely, and create a service page. This means that now everything doesn’t have to be one-size-fits all for every single topic page; instead, they can be one-size-fits-most. I recall the first session we had as a larger team, where we identified goals to make the project a success. One of the goals we identified was that we wanted this website to be the single face of state government for top constituent services. As a constituent, you need to complete certain tasks, and our priority is to clear your path. We still have a lot of work to do, but even the smallest of improvements can make a vast difference for folks that need it most. The importance of the Jobs-To-Be-Done philosophy really came to life for me when someone from the AIGA design critique shared their personal, childhood story with me; getting a tax refund on time determined whether her family could put their next meal on the table. Knowing that our work can have a profound impact on fellow constituents behooves us as designers and developers to maintain a user-centric focus in the work we do. We’d love to hear your thoughts or feedback on redesigning government brands and their digital solutions and the user of user-centric approaches. Please keep the discussion going below via the comments or Tweet Us, @Velir! We’re passionate about creating digital experiences that help brands better connect with their audiences.